How has been learning new English vocabulary and sayings been going for you? If you are like me learning Spanish or Swedish, and now Russian, you feel like you’re making slow progress. We’re not alone. Learning new vocabulary quickly and efficiently is a difficult thing to do. In my own journey to learn vocabulary, I’ve tried many different techniques. One technique was making my own flashcards. Another technique was making word lists that I wrote every day until all the words on the list were memorized. This latter technique is what allowed me to ace my university Spanish exams and learn a hundred different words in under a week. While the above techniques works, if you want to learn vocabulary and sayings even quicker, you need to use what the professional polyglots use. Well, they use a special application called Anki. 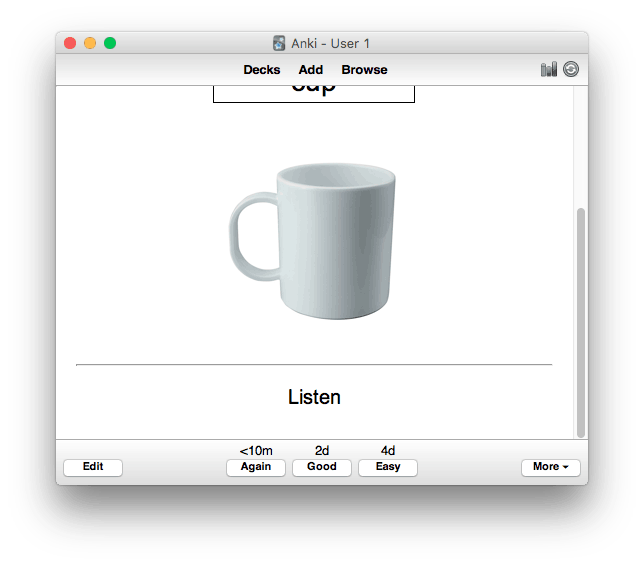 Anki is an SRS (spaced repetition system) that allows you to create electronic flashcards. Good question. There are a few things that make Anki special, and for now, the king of flashcards. Whether it is other electronic flashcards or your own, handmade flashcards, these flash cards do not have spaced repetition. Spaced repetition allows you to avoid reviewing words you already know, and review words that you don’t know very well. Let me give you an example to illustrate. Let’s say you make flashcards from the English words horse, dog, and car. The first time you review them, you realize that you already know horse, but you don’t know car or dog. Now you don’t want to throw out the card because you will want to review it in a few days or weeks. Neither do you want to put it somewhere else in your room or house because then you will probably forget about it. So what do you do? You stick it back in your pile and you’re forced to look at it every time you review the cat and dog. This may not seem like a big deal, but imagine you are learning the 625 most common words in English. Imagine how many flashcards you would have to go through just to get to the words you don’t know. It’s a pain in the neck and a waste of your time. Anki solves this problem by hiding words that you already know, and only showing words that you need to review urgently. Words that you already know do not disappear forever, they are just not reviewed as often. Every time you successfully review a word or saying, the next review time is pushed back further and further. Instead of every day, you review it in 2 days. If you successfully review it in two days, you review it next time a week later. If a week later you review it successfully, you won’t see it again until a month later. If you review it successfully then as well, you won’t see it for another 3 months. Words that you cannot remember though never get pushed back. If you remember DOG one day, but can’t remember DOG 2 days later, you will review DOG in 2 days, not in 1 week. Not until you can successfully remember DOG will it be reviewed a week later instead of 2 days later. This is good for you because you can focus on the words you don’t know, saving you time and energy. How much work do you need to do to create this SRS? None at all. Anki does this all for you by using its algorithms. Without a doubt you can customize your own, handmade cards. To be honest, if you are incredibly artistic and creative, you should probably be doing this. However, most of the world is not creative and artisitic, and you probably don’t want to draw every word that is in your deck of flashcards. You could print out images for each word, but that can cost money and is a lot of work as well. The fastest way isssss… Anki. 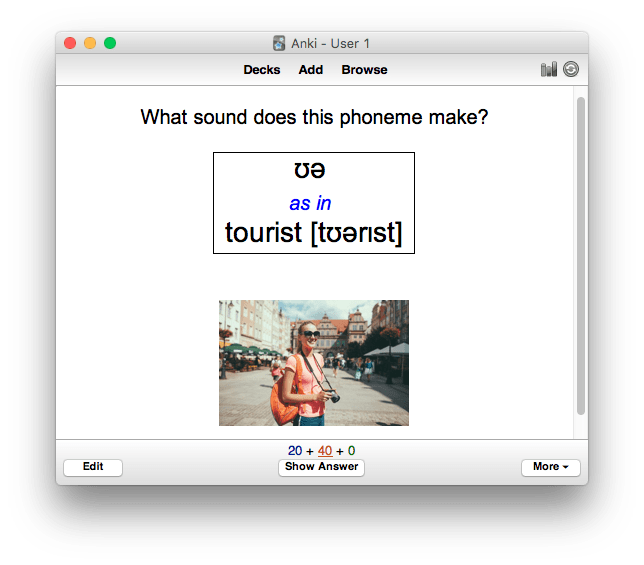 With Anki you not only can take images from the internet or your computer and put them into your flashcards, but you can also put in audio! Pictures and audio when combined give you an audiovisual experience which better allows you to memorize the word. You may ask, “where do I get the audio profe?” Another good question. The best place would be Forvo for basic words. If you need audio for a saying, your best bet would be using Audicity to take your saying from the movie, song, or tv series that you heard it. Besides the audiovisual customization, you can also customize the fields to create different types of flashcards. You could make a fill in the blank flash card, a spell this word flashcard, a listening flashcard, and a visual flashcard. I’ll admit that this can be a little tricky to learn to do, but once you do learn it, it is very easy to do. What else do I need to say about this… it’s free (except for anybody who wants to use it on their iphone). If you are looking for the quickest, easiest, most dynamic way to memorize new vocabulary and sayings, there is no better option today than Anki. Could this change? Obviously. Technology is moving at such an incredible pace that I’m sure that new SRS systems will come available. Will they be free though? I doubt it. If you like the sounds of Anki, sign up to receive the Anki decks I made for beginner students. After signing up I’ll send you an email with instructions on how to download Anki to your device. Get Your Anki Download Instructions!